Jun. 29, 2017 10:30 a.m. The votes are in and the winners chosen in Black Press Media’s biggest contest, in celebration of Canada 150. More than 271,000 entries were casted, and thousands of dollars given out, from cash prizes to tickets to Coldplay and Bruno Mars. 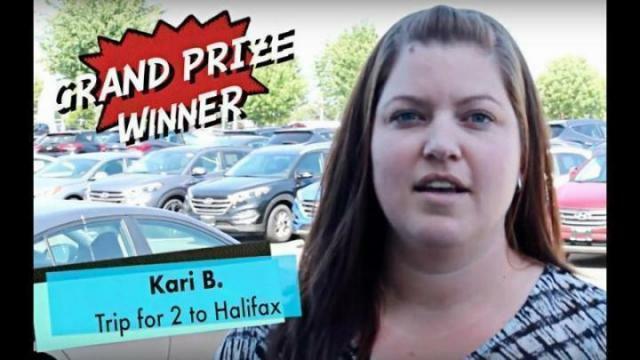 We’d like to congratulate Chilliwack resident Kari Bertrand, who won the grand prize: a trip for two to one of seven Canadian destinations, sponsored by Travel Brands, Air Canada and Travel Best Bets. Bertrand and her husband will be heading to Halifax for five days, along with $1,000 spending money. “Last week I was telling my husband that I did feel like a big win coming and it was going to happen this week,” Bertrand said, who entered about 60 times. Karon Brookes of Langley won a trip for 24 of her closest friends and family in a sleeper Genesis 66 Waterway Houseboat, courtesy of Waterway Houseboats. “My husband and I wanted to get away, but this is more than we could ever anticipate,” she said. A one-week RV vacation complete with $500 in groceries and a $100 gas card, courtesy of Fraserway RV. Winner: Sherralynne Cleland, Union Bay. A two-night stay at the Ramada in Kelowna and four green fees at Gallagher’s Canyon Golf Course. Winner: Denise Coulas, Hope. A two-night stay including parking, wi-fi and health club access at St. Eugene Golf Resort & Casino in Cranbrook. Winner: Shannon Casey, Lumby. A pair of tickets to see Bruno Mars at Rogers Arena in Vancouver on July 26. Winner: Gaetan Dube, Fernie. A pair of tickets to see Coldplay at BC Place Stadium in Vancouver on Sept. 29. Winner: Leslie Cochrane, Duncan. A two-night stay at the Oak Bay Beach Hotel in Victoria. Winner: Raven Fenton, Prince Rupert. Two return trip fares from Vancouver to Victoria courtesy of Helijet. Winner: Kathy Reid, Sidney. A two-night stay at the Beach Club Resort in Parksville. Winner: Neil Atleo, Nanaimo. A two-night stay at the Fairmont Empress including dinner for two in Victoria. Winner: Shirley W Nelson, Quesnel. A two-night stay at the Union Club of British Columbia in Victoria. Winner: Jennie Beal, Red Deer. Tickets to BC Lions games at BC Place Stadium in Vancouver. Winners: Mary Deadmarsh, Kelowna. Georgia Wiltse, Kelowna. Jim Forsyth, Maple Ridge. Tickets to Vancouver Giants games at Langley Events Centre in Langley. Winner: Patrick Selby, New Westminster. Maureen Watt, North Vancouver. Neil Borkowski, Surrey. Ten $150 cash prizes courtesy of Prospera Credit Union. Winners: Elisa Burnett, Kelowna. Alana Baumfield, Agassiz. Winfield Mott, Trail. Bob Vanbeers, Vancouver. Douglas Hill, Cranbrook. Stephanie Lau, Victoria. Jason Ens, Abbotsford. Ross Davidson, Coquitlam. Stephanie Emro, Delta. Patti Scott, Surrey.